Join us in this participatory sharing of soulful songs, chants, and dance. 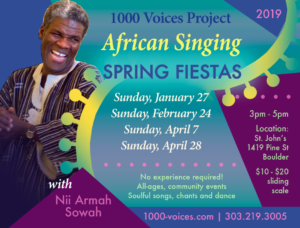 Nii Armah is a master teaching and treasured Boulder community leader. He uses African song and dance as tools to build healthy communities, raise consciousness and improve quality of life. Bring your friends and family for this all-ages community gathering. This entry was posted by Marissa Saints. Bookmark the permalink.